Several years ago, back when I first started blogging, I came up with a recipe for Snickerdoodle Blondies for one of my coworkers. This little recipe has been one of the my most popular, only second to my Better Than Starbucks Lemon Poundcake, and has a bit of a cult following. There are so many reasons to love this recipe: they take almost no time to make, their taste and texture appeals to the pickiest of palettes, they are inexpensive to make, they smell amazing when they are baking.. I could go on and on! Not only that but you probably have the ingredients for them in your kitchen right now. No pomp or circumstance needed! Just real butter, please but that should go without saying. I have to admit that this recipe almost never saw the light of day. The first time I made it I was new to experimenting with recipes. I was multitasking like mad and took them out of the oven much too soon. When I flipped them out of the baking pan onto my cooling rack, they were so under-done they practically oozed through the wire rack! After crying out in horror, I very quickly flipped it back into the baking pan with the surface looking like an earthquake had rattled it at its core. I was sure I'd messed them up beyond repair but they recovered beautifully. The cracked blondies repaired themselves while they continued to bake and lo! the Snickerdoodle Blondie was gifted upon the world! Phew! One of my favorite things about this recipe that I probably should have mentioned first is their versatility. I made a variation of these little guys that involved a pumpkin layer that is really wonderful too or you can jazz it up just by adding your favorite candy treat. With Halloween coming up you may find yourself being invited to parties but not having a lot of time to bake or just having a lot of left over candy and wanting to make something festive. Say hello to your lifesaver! This time around I skipped the cinnamon sugar crust and grabbed a bag of I went with Reese's Pieces, but you could use just about any kind of candy that can melt. So now it's your turn! Be creative! Make a version of this recipe with your favorite candy and tell me all about it. Get the kids involved! It's a great basic recipe for them to make that they are sure to love and you will too! 3/4 cup of Reeses Pieces + 1/4 -1/3 cup for embellishing the top (this can be increased to 1 cup. It really depends on how big the pieces of candy are. Use your best judgement). Preheat oven to 350F. Lightly grease a 9 x 13 inch pan. Sift together flour, baking powder and salt and set aside. In large bowl, beat together butter, sugar, egg and vanilla until smooth. Stir in the flour mixture until well blended. Add 3/4 of a cup of Reese's Pieces. Mix gently. Spread evenly in prepared pan (mixture will be somewhat cookiebatter-ish.). Sprinkle 1/4 - 1/3 of a cup of Reese's Pieces on top, pushing down with your hand to ensure proper "candy to cake batter contact". Bake 25-30 minutes or until surface springs back when gently pressed. Cool slightly. While still warm, cut into bars with a sharp knife. 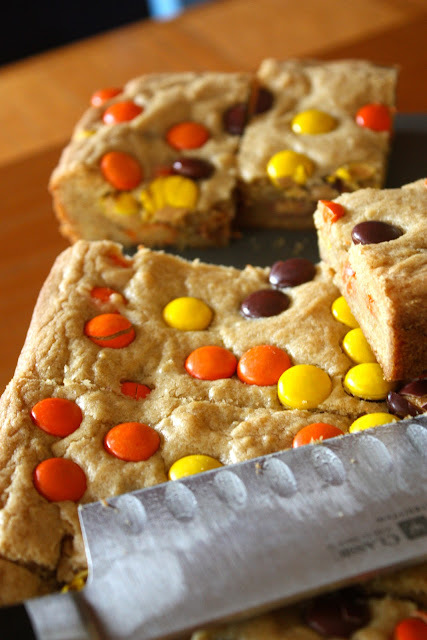 These blondies look heavenly with peanut butter pieces! I love these!! I am going to try making these for sure! You'll love them Laura! Please let me know how they turned out. You too Diana! :) Let me know how they turn out. Just put these in the oven to take to a neighborhood get together this evening. Can't wait to try them! Hi Kristin! How'd they come out? Just wanted to let you know I baked these and they were delish.